B'Ezras HaShem Yisborach, by the grace of G-d, may He be blessed. In Memory of Howard Chaim ben Leah (Grief). I am grateful for the invitation to speak to you today in the Hall of Nascent Sanhedrin. It is an honor to be asked to speak in a place of Torah, before people of wisdom. I have been asked to address two matters in the span of ten minutes, my feelings about Howard Grief, and my perspective about the Har HaBayit, Temple Mount in International Law. I was saddened at the news of International Law expert Howard Grief's passing. But more than sadness, I am concerned. Concerned that today's scholars will not be able to speak as strong and freely as Howard Grief did. He was polite, but never catered to political correctness over absolute truthful analysis of International Law about a region in which a clear declaration of the truth is just as important as its understanding. We must learn from Howard to not allow distractions nor an air of political correctness in legal discourse of International Law and Israel to keep us from speaking the simple truth. Howard brought to our attention the San Remo conference of 1920 and its profound effect on Israeli sovereignty to all of the Land West of the River Jordan. In my effort to emulate him, I will need to use the rest of this time to discuss International Law. But unlike Howard Grief, I did not spend 25 years writing a book before publishing my thoughts. Instead I have posted them publicly on my blog, Jerusalem Defender, for the past several years, so that some aspect of peer review would occur. I want to point out that what I am speaking of Torah scholars already know, the only innovation here is to emphasize its significance in International Law. In Sefer Ezra, the book of Ezra, we find the world leading political power, the Persian-Median Empire’s recognition of Jewish rights to Eretz Yisrael, the land of Israel, including Yehuda veShomron, Judea and Samaria, and Har Habayis, the Temple Mount in particular. In the Book of Ezra, chapter 4, which occurred some 2500 years ago, when the Jews were also returning to the Holy Land from an exile, the leading political power of the World at the time was the Persian-Median Empire. The Emperor Artachshast(a), in Aramaic – Artaxerxes, in English, converses with the leaders of the adversaries of the Jews in the Holy Land. Both the jealous leaders of the Arabic areas of the Trans-Euphrates region of the Persian-Median Empire and the main political leader of the World in that age itself each refer to the land of Israel as territory that stretched out to the River, the Euphrates. A Jewish Right of Return and legal authority of the Land of Israel was recognized by the International Community of that day. The Persian-Median recognition of Jewish rights to Har Habayis (the Temple Mount) is also interesting to consider, despite the inconsistency in its history of applied sovereignty due to the Babylonian exile. From the Persian-Median perspective, however, it seems that this too was not an impediment upon viewing Israel's rights to include all the land which they had acquired under King David. Thus there exists a profoundly deep historical reality of International Recognition of Jewish Rights to the Land of Israel from ancient times and until today. Israel annexed East Jerusalem 33 years ago. But even then the status of Israel's claims to the Temple Mount seemed on the surface to be in doubt, despite Jerusalem's reconquest, for in 1967, less than a month after it's capture, the keys to the Temple Mount were handed over to the Waqf. This was, however, a transfer of administrative control exclusively, but not of sovereignty. The transfer was conducted by the defense minister, not by a head of state, to an Arab organization, not with a government. Further, this took place prior to the Oslo Accords, and outside of them, yet no legally binding change to this administrative transfer has since occurred. The Clinton Parameters, the suggested split of Har HaBayit and the Western Wall, in the closing days of the Clinton Administration, were never accepted in a finalized peace deal. Religiously speaking, the Temple Mount has been reserved for this time in history according to the Bible. Before Islam was formed, it was already known and accepted that the location of the Temple Mount was reserved for the Third Temple. The buildings currently on the Temple Mount do not change the fact that Jewish history predates Islamic history and the Jewish prophets are revered by the very text of the Islamic Faith itself. Would that our political policies reflected our religious responsibilities so that freedom of religion is at long last fully restored to the Jewish People, by rebuilding our Holy Temple in its place, that very holy place as was chosen by Heaven itself. May it soon be so, by the grace of G-d, B’Ezras HaShem Yisborach. 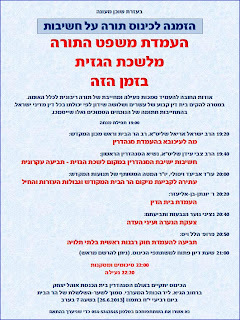 The flyer for the event at the Hall of the Nascent Sanhedrin. Assaulting one's way of life is not consensus building. The attempt to force chareidim to give up Torah learning and join the army is misguided and needs to be rethought. By encouraging an increase in voluntary chareidi enlistment perhaps a compromise solution can be found. Take societal pressures out of the mix, there is no pressing need for chareidim to join the ranks of the IDF. To eliminate discontent in society, one must do so in a manner that leaves as little collateral damage as possible. Appeasing this group of society by displeasing that group of society is politicking for votes, not pursuing a path toward true societal improvement. Bottom line, the current drive to force the Chareidim into the IDF is going to leave some group hurt if it is implemented. The question is not being put in the correct light. There is no question that even the greatest of Rabbis in history have worked while they studied, and there is no question that in an emergency a Torah scholar is supposed to interrupt his studies and help those in need. The question is this: Does the IDF currently need the chareidim to be drafted in order for the security of the State of Israel to be provided? The answer is no. Will a draft of the chareidim be a minor interruption to their societal norms, as well as their religious convictions? The answer is also no. It would be a disastrous upheaval according to many of the greatest of our Rabbis. Therefore being "fair" to the majority via the destruction of a minority is what is being proposed. If those who support the chareidi draft proposal get their way, will Israel be stronger morally and ethically for it? I suggest no. If rather than trying to force this down the chareidim's throats, a suggestion would be made to their Rabbis, that in order to make a significant percentage of disgruntled citizens feel more respect for their Torah scholars, if the Chareidi leaders would please come up with some internal solution to the batlanim (idlers) who abuse their privileges as chareidim to do nothing while other (the real) chareidim learn intensely, and non-chareidim serve in the army. Deescalate this situation from confrontation and blackmail to negotiation and consensus building. The new leaders in the Knesset were put there to be diplomats, not enforcers, leaders of all Israelis, not just for a single constituency. Perhaps they should act that way? By the grace of G-d, I've been offered to speak at a conference in Jerusalem in a few weeks, but could use a sponsor to grant coverage for travel and lodging expenses, as I currently reside in New York and do not have full time employment at this time. 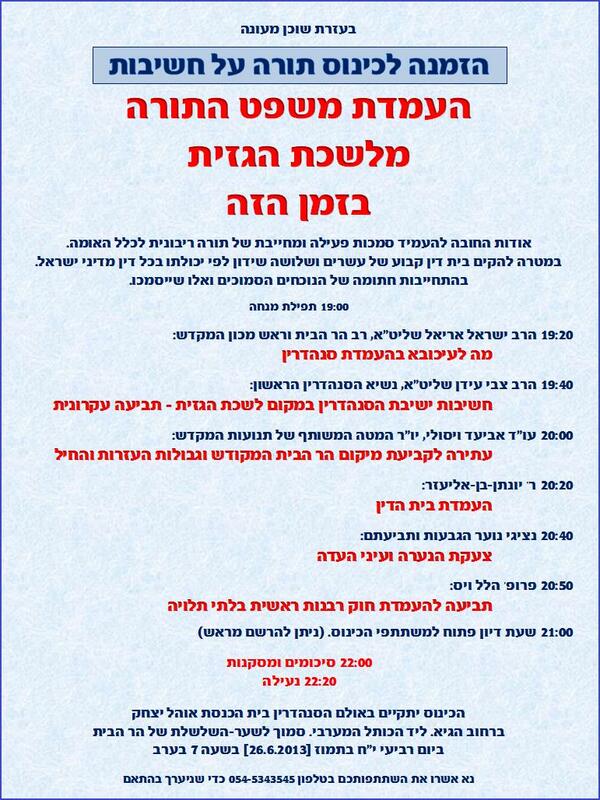 One of the topics I plan to speak on is the status of Har HaBayit, the Temple Mount in International Law. I wrote about that briefly on this blog a month ago. This would be a great way to support what we do here. All we do is with the help of Heaven. Now here's a way you can help too. Please pass the word along to someone who you think may be able to help. Please contact me if you have any leads, Author@JerusalemDefender.com Thanks. I was saddened at the news of International Law expert Howard Grief's passing. But more than sadness, I am worried. Worried that today's scholars will not be able to speak as strong and freely as Howard Grief did. He was polite, but never catered to political correctness over absolute truthful analysis of International Law about a region in which a clear declaration of the truth is just as important as it's understanding. I say this not because there are not also brilliant minds in this generation, but because distractions, an air of political correctness in legal discourse of International Law and Israel, in a place where only the simple truth will do. The sages of the Talmud relate in the first chapter of Ethics of the Fathers, that civilization is founded upon truth, justice and peace. Thus without an adherence to truthful application of justice (International Law) there cannot be peace. Therefore for scholars to fail to emulate the Howard Grief style, would be to risk failure in pursuit of finding a true path to peace. While I may lack Howard's superior politeness and scholarship, I will attempt to address this as truthfully as I can. Recently I have heard some scholarship attempting to support the current Knesset's policies by saying do not question that a Two State Solution can work, when there exists a defacto Palestinian state already. In my opinion, this is a statement of political leanings, not a declaration of legal standards. Defacto means "an actual practice, but not necessarily one ordained by law." Further, such recognition is generally provisional. In this case, on condition of a final peace deal between Israel and the Palestinian Authority. Also keep in mind the concept that a state must function as a state and also be recognized as one to be granted full rights under International Law. Palestine is not (yet) a state that can even make a treaty. Is Palestine a quasi State? Logically speaking, if Palestine existed before the Oslo Accords which of course it did not, then for some strange reason it agreed to not become a State (again?) when it signed the Oslo Accords until after the Final Status discussions were concluded and signed as a treaty. Never happened, never will. The United Nations specifically granted limited recognition only, not full recognition. For what reason? That they are already a state? That they should be considered a state? Some of the countries that supported the PA only on condition that their limited recognition would not interfere with the treaty between them and Israel, other states that were trying to legalize the Palestinian Authority. But their intentions and current practices do not overrule Oslo, from their own reasoning, which essentially renders the UN resolution legally null and void, as customary law cannot overrule a treaty between member states and certainly between a member state and an ethnicity within it's borders. (Jordan has no legally binding joint claim over Judea and Samaria (the West Bank.) Thus even the quasi recognition by the UN, did not change that status. The Palestinian Authority lacks the full functionality of an independent state, rather functions more like a sub-state within a nation, as a state or county in the United States does. Interstate border issues, such as an environmental hazard that is bothering a neighboring state may soon find itself to the needs and dictates of the federal government, and as far as defacto status goes, Israel does not share authority with the PA, it is the superior authority in anything that Israel deems is or is not in its interest. It took an Israeli court order to change the location of security fence in Samaria, for example, not any force, command or pleading from the Palestinian Authority. The Oslo Accords are have already expired, according to scholars like me, and only remain as a defacto practice by the majority of the United Nations to pretend that it is not over. This, however, cannot overrule Israel's Fundamental rights (Jus Cogens) of self preservation by preventing the formation of a terrorist state within its border. So there is not a legal reason to continue to recognize the Palestinian Authority at all, just a current practice to really, really, really wish really hard that it would become a real state after all. My legal advice: Wake up, people! If not for the idea of a One State Solution with the IDF in charge of things, there would be no logical expectation of peace in the near future. Therefore today's legal scholars must ignore their own political views and work towards finding the optimum One State Solution that works best for long term peace so that International Law may be upheld and peace be obtained.